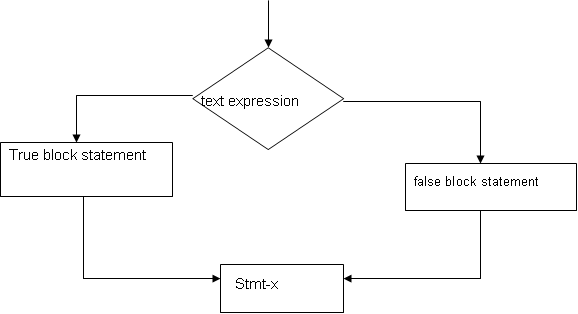 It allows the computer to evaluate the expression first & then depending on whether the value of the expression (relation(or)condition) is 'true'(non-zero)or 'false'(zero),it transfer the control to a particular statement .This point of program has two paths follow, one for true condition & the other for the false condition. 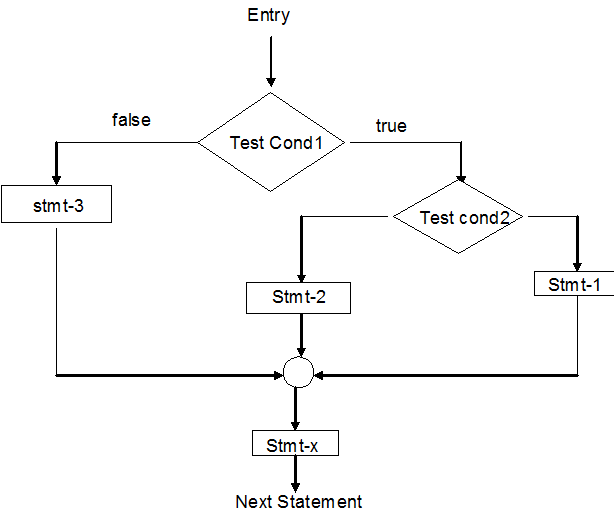 The statement-block may be a single statement (or) a group of statements. if the test statement is true, the statement-block will be executed, other wise the statement block will be stopped & the execution will be jump to the statement –x. Note: when the condition is true, both the statement block & the statement-x are executed in sequence. It is an extension of simple if statement. 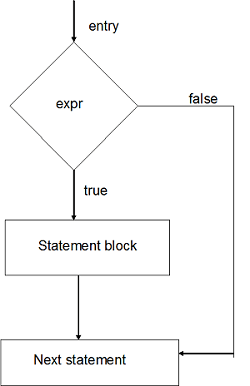 If test expression is true, then the true block statement, immediately following the if statement are executed ; otherwise the false block statement () are executed . In either case , either true-block(or) false block will be executed, not both. If the condition 1 is false , the statement-3 will be executed otherwise it continues to perform the second test . IF the condition-2 is true, the statement-1 is evaluated; otherwise statement -2 will be evaluated & then the control is transferred to statement-x. Program to find max of 3 numbers. There is another way of putting 'if's together when multipath decisions are involved. A multipath decision is a chain of 'if's' in which the stmt associated with each else is an if. It takes the following general form. This construction is known as else if ladder. The conditions are evaluated from the top to bottom. As soon as true cond is found, the stmt associated with it is executed and the control is transferred to stmt-x(skipping the rest of ladder) when all the conditions become false, then the final else containing the default stmt will be executed. Example: Write a program to read in the marks of a student and display the grade according to the following information using else-if ladder. Program to find maximum of three numbers using else-if ladder.